Like the idea of a best-of-both-worlds feel? Say hello to the new eLuxurySupply hybrid mattress. eLuxurySupply has been producing quality mattress and bedding accessories at affordable prices for quite some time now. Will its new hybrid mattress raise the bar for the company? Continue reading to find out! Don’t have time to read the full review? Click here to skip to the review summary. 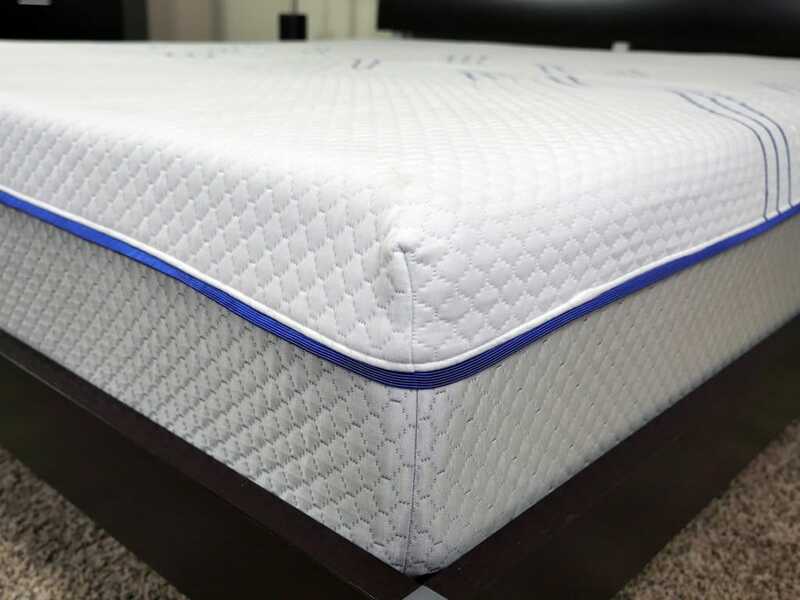 The eLuxurySupply hybrid mattress is 12″ thick and consists of a mixture of foam and microcoils. 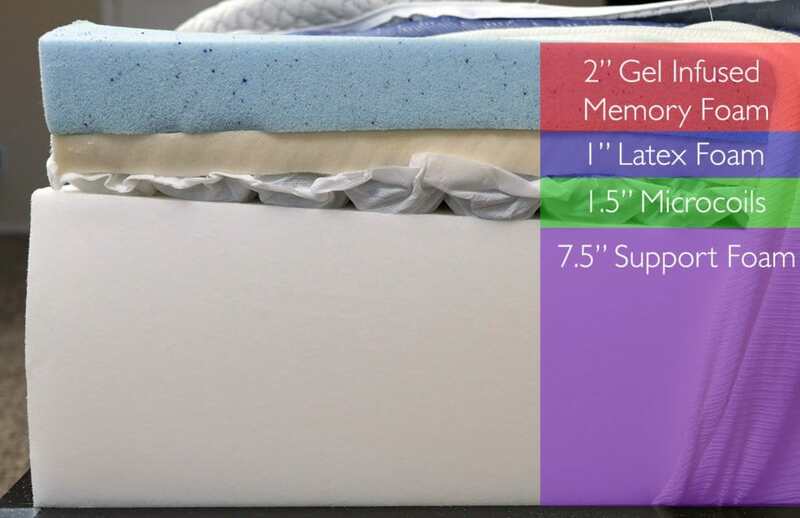 Top layer (comfort) – 2″ of gel-infused memory foam. This top layer works to provide the initial comfort for the mattress as well as some of the cooling characteristics. Second layer (contour and pressure relief) – 1″ of latex foam. Placing a layer of latex below the top layer of memory foam increases response times. Additionally, the latex works to supply bounce and pressure relief while also adding to the breathability of the top foam layers. Third layer (transition and support) – 1.5″ of encased microcoils. These small coils provide comfort and a nice bounce, and act as a transitional support for sleepers. Additionally, they help to improve cooling. Bottom layer (support and foundation) – 7.5″ of support foam. This bottom layer acts as the foundation for the mattress and offers both support and deep compression support. The cover of the eLuxurySupply hybrid mattress is composed of 100% polyester. Polyester is a highly breathable fabric, which works well with the interior materials to maintain a cooler sleeping surface. In terms of aesthetics, this mattress contains a modern design. 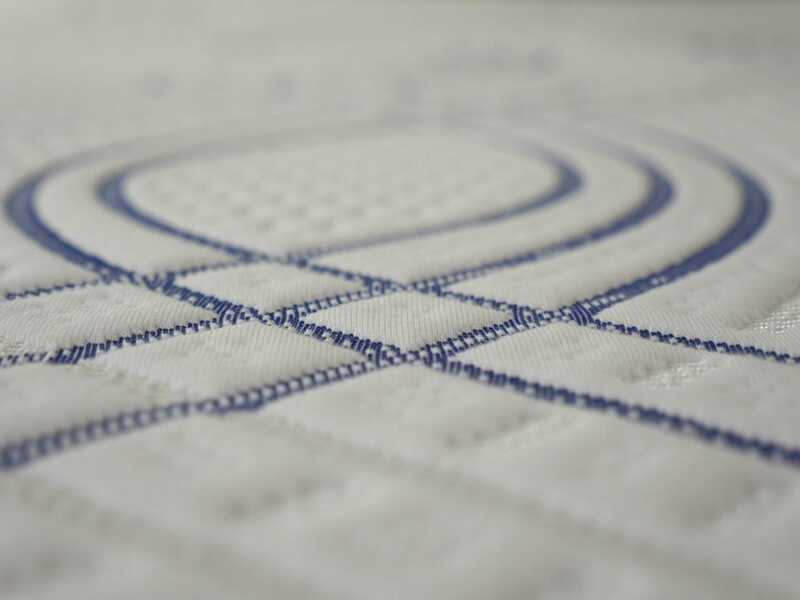 A white top piece with blue lines woven along the upper half of the mattress helps to add a little flare to the cover. Gray side panels make up the perimeter of the mattress. All things considered, eLuxurySupply did a good job designing and delivering their hybrid mattress cover. The eLuxurySupply hybrid mattress brings home a medium feel, landing at a 5.5 out of 10 on the firmness scale, where 10 is the most firm. With the medium firmness level, eLuxurySupply created this mattress to meet the needs of a wide array of sleepers. With balanced levels of sinkage and hug around your body, the eLuxurySupply hybrid does a fine job of relieving pressure points, providing support, and remaining fairly cool. As I initially lay on the mattress, there were no signs of pressure points. The combination of memory foam and latex did a great job of offering the right amount of softness for my body, helping to avoid those pressure points. FAQ: What mattress firmness do you need? The sinkage of this mattress was not immediate. There was more of a gradual level of sinkage, meaning I sank when I first laid down but felt a bit more sinkage after several seconds. That said, the sinkage was not dramatic or enveloping. I only saw about 2″ while lying normally on my back. Support was another area where the eLuxurySupply Hybrid performed well. Although I am primarily a stomach sleeper, I had no issues sleeping on my side, back, or stomach. Each position I slept in felt like I had proper spinal alignment. Once again, the combination of memory foam, latex, and microcoils created a well-balanced feel that led to good support throughout my sleep tests. Edge support was also above average. While sleeping on this mattress, I forced myself to sleep on the edge a few nights. The mattress never once felt like it was going to eject me. The hybrid design plays a large role in these stronger edges. On mattresses with stronger edges, couples may find amorous activities more enjoyable, as well as daily activities like using the edge to get dressed, watch television, etc. Next up, we’ll talk about bounce. 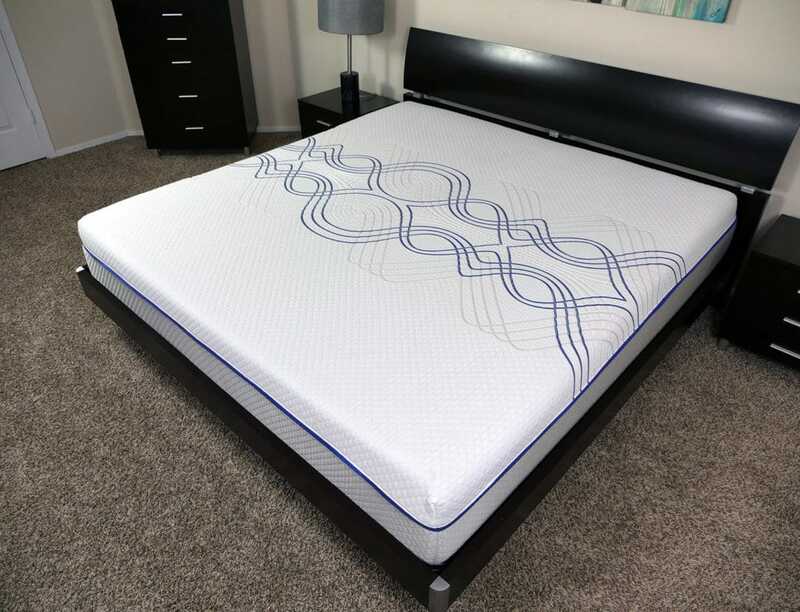 The hybrid design certainly helps in this area as well, but not many hybrid mattresses we have tested contain a layer of latex between the top layer of memory foam and the third layer of microcoils. This use of latex certainly aids in the responsive nature of the mattress, helping to push back against the sleeper when pressure is applied and creating a higher degree of bounce. Better bounce also leads to more enjoyable amorous activities. The added latex is especially important due to the top layer of memory foam being relatively soft and having a strong degree of contour and sinkage. The latex and microcoil combination work well with the top memory foam contour layer. With a higher level of bounce does come a bit more motion transfer. As noted above, the hybrid design does a good job of responding to pressure and pushing back, but this pushback creates energy that is not always transferred into the mattress. Instead, some of this energy has nowhere to go but across the mattress, creating more motion transfer for those sleeping with partners. Last but not least, the eLuxurySupply hybrid had no issues maintaining a cooler sleeping surface during my sleep tests. 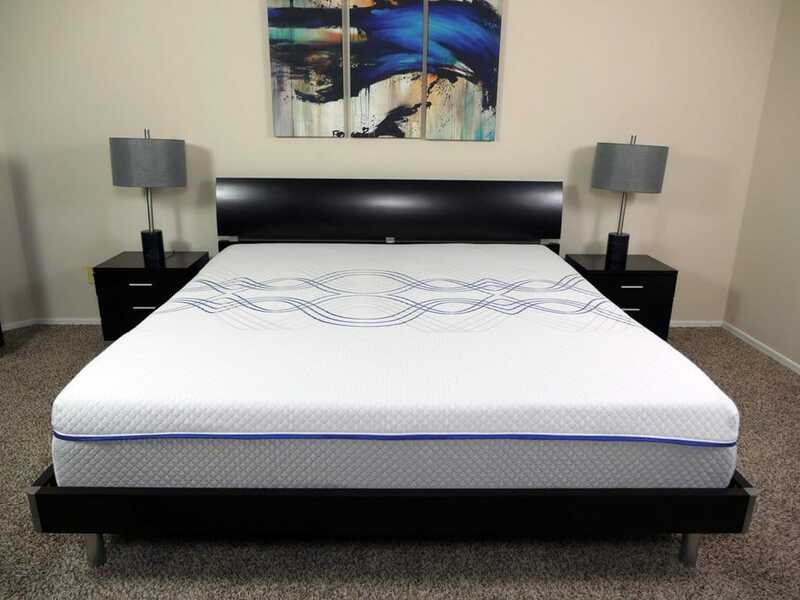 Again, the gel-infused memory foam, latex, and microcoils all combined to create a higher level of breathability, allowing for optimal levels of airflow in and out of the mattress. While I did not sleep hot on this mattress, that does not mean every sleeper will remain cool. Some heavier sleepers or naturally warm sleepers could run into a bit of a warmer sleeping experience. With a soft top layer of memory foam, the sinkage could be deeper for some heavier individuals, leading to more hug around the body and generating more warmth. The same goes for naturally warm sleepers, who could notice a degree of warmth from the memory foam top layer. Ultimately, for most individuals, this mattress will sleep cool, in my opinion, but some could run into heat issues depending on their body type, weight, and preference. All mattress reviews that Sleepopolis completes include five different sinkage tests. These tests are designed to give sleepers an idea of how the mattress performs in various positions and conditions. Lying on my back – While lying on my back with my weight evenly distributed, I experienced 2″ of sinkage. Lying on my side – While lying on my side, I experienced 3.25″ of sinkage. Sitting on the edge (conservative) – While sitting near the edge, a bit further away from the absolute edge of the mattress, I experienced 3.5″ of sinkage. Sitting on the edge (aggressive) – While sitting on the absolute edge of the mattress, I experienced 4.5″ of sinkage. Standing in the middle – While standing in the center of the mattress with all of my weight on a single location, I experienced 4.5-5″ of sinkage. Bear in mind, I am 140 pounds, so your individual sinkage results may be higher or lower depending on your relative size and body type. Shipping – Free shipping within the United States. Most orders will arrive in less than seven days, compressed in a box. Who should buy the eLuxurySupply hybrid mattress? Want a medium feel – The eLuxurySupply hybrid offers a true medium feel, landing at a 5.5 out of 10 on the firmness scale, where 10 is the most firm. Like the idea of a hybrid mattress – With a hybrid mattress, sleepers will experience higher levels of bounce, more motion transfer, better edge support, good cooling, and a decent level of hug and contour. Want a cool mattress – The hybrid construction typically ensures good cooling. The eLuxurySupply hybrid combines gel-infused memory foam, latex, and microcoils for a high level of breathability and a cooler sleeping surface. Want to buy from a reputable company – eLuxurySupply has been in the bedding industry for quite some time, is run by veterans, and always puts the customer first. If you’re looking to buy from a company who truly cares about its customer, eLuxurySupply should not be overlooked. Looking for more information on the eLuxurySupply hybrid mattress? Visit eLuxurySupply.com. 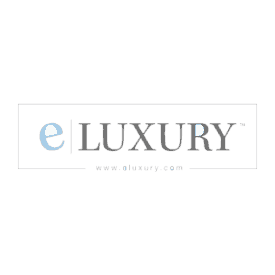 The eLuxurySupply 12″ hybrid mattress is a well built mattress consisting of quality materials. For the sleeper who’s looking for that best-of-both-worlds feel, this mattress should not be overlooked. At $999 for a Queen size, this hybrid mattress offers a good value in addition to a high level of performance.